I love traditional capresse. It's a great way to enjoy the summer's crop of vine ripened tomatoes. Stacks of luscious tomato slices, creamy fresh mozzarella and fresh from the garden basil drizzled with good quality finishing olive oil is my idea of a perfect bite. But just because something is traditional or considered perfect, doesn't mean there isn't room for a little flourishing on occasion. A few weeks ago, during an evening walk with Starbuck, my Auntie Syl mentioned she needed to come up with a couple of appetizers to take to an afternoon work party. I helped her brainstorm a few ideas and then a few days before the event, she told me she'd seen something on TV she wanted to try: a twist on capresse that replaced the tomatoes with watermelon. What a great idea, I thought! So I gave her a few suggestions and on the day of the party, I helped her put together a few of them before I left her assembling so I could get ready for work. For the version she made for her party, I suggested she drizzle some of my lemon infused olive oil over them to finish them off. That night, when I got home from work, she said the appetizer was a huge hit. Then recently, while making the balsamic reduction I shared here, I thought it would be interesting to switch out the olive oil for some of the balsamic glaze I planned on making. Not only is it interesting, but a rather tasty twist! 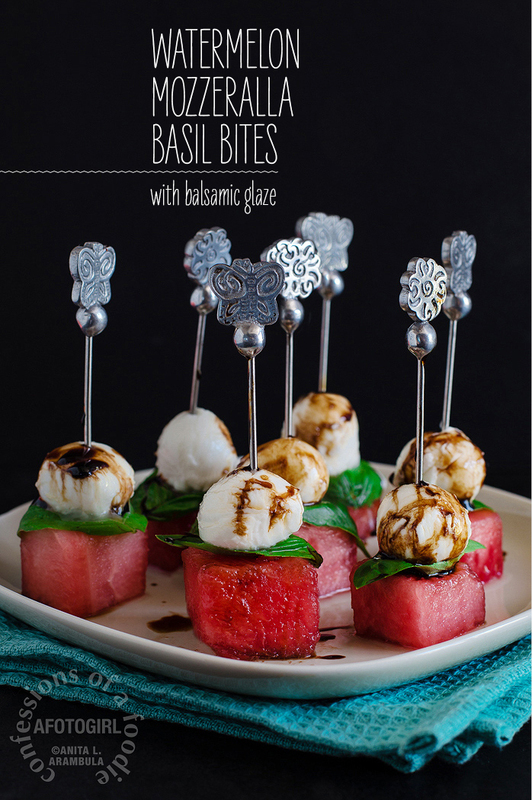 The sweetness from the watermelon is mellowed by the creamy mozzarella which in turn is brightened by the freshness that the basil brings to the party. 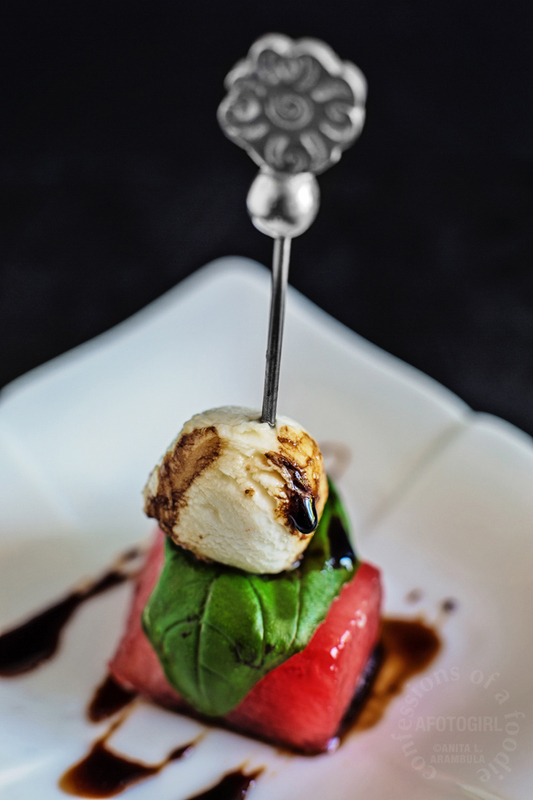 Then the hint of slightly sweet and acid goodness from the balsamic glaze hits the tastebuds, cutting through the creamy mozzarella to balance out the bite. There are still plenty of days left to enjoy summer's warm weather and bountiful produce. This is definitely a great appetizer to enjoy with a glass of chilled rose while waiting for the coals to heat up. It's Thursday. The weekend is almost here. I say, invite some friends over this weekend and give these a whirl. I think they just might become a part of your summer party repertoire. I know they have mine! Stack the watermelon, basil and cheese so that the watermelon is on bottom. Carefully pierce the cheese with the cocktail skewer and continue guiding it all the way through to the watermelon. Place on serving tray. Repeat with remaining watermelon, cheese and basil. 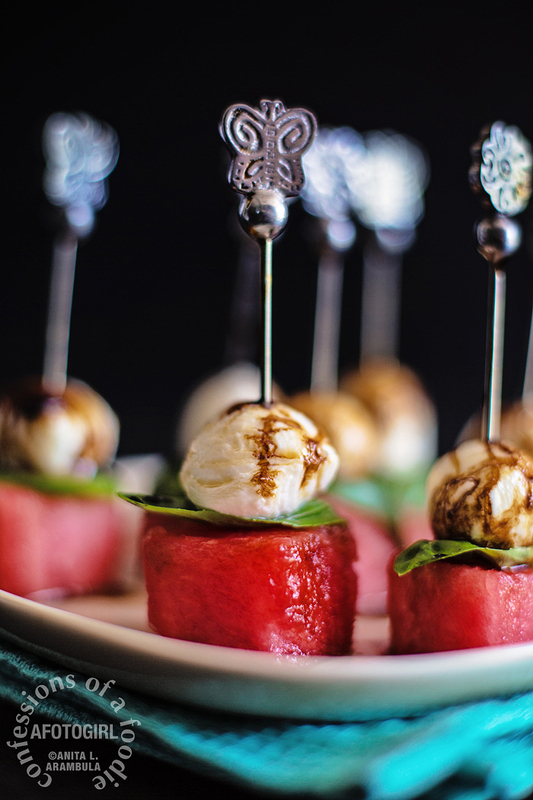 Drizzle the balsamic glaze over the skewered watermelon cheese bites allowing excess to land on the serving tray (to make it easier to drizzle, microwave the glaze for 8-10 seconds). Carefully cover with plastic wrap and chill until ready to serve. When your guests arrive, remove from the refrigerator and allow to sit for 5-10 minutes before serving. *Cilegenie (see-lay-genie) translates to "small cherry" and these little guys are about that size. Though other brands are available from major grocers, I like this Trader Joe's brand because of their size. Looks delicious! Yup, I like the Trader Joe's ones, too. It saves me the time of having to cut up a larger mozzarella.